The Saffron Plant | Beautiful, Exotic and Expensive - But Oh So Worth It! The Saffron Plant, Tasty, Beautiful, Exotic and Rather Expensive! The saffron plant is prized around the world for its distinctive flavour, health benefits, and vibrant golden colour, and is the world’s most expensive spice. You get the spice from the orange-red stigma of the crocus flower (Crocus sativus). These stigma measure less than 4 centimetres, and must be gently harvested by hand with each flower providing just three small strands. Bear in mind that it takes nearly 75,000 flowers to produce just a single pound, and you can see why it's so costly. A genus in the family Iridaceae, it's originally native to Asia, but today it's grown and cultivated all around the world, with Iran producing about 90 per cent of the world’s total supply. It's also sterile, so the reproduction of the saffron plant depends on us. The underground bulbs must be broken apart and replanted in order to generate new growth. Folks have been growing and harvesting this plant for millennia. One of the first references to the saffron crocus can be found in an ancient Assyrian botanical reference dating back to the 7th century BC! Read more on the history. Today, it is grown in a number of countries, preferring hot dry summers and semi-arid conditions. The plant thrives on lots of spring rain (or irrigation), and a drier summer. Late summer or early autumn rain can help boost the yield. 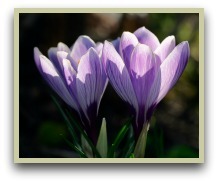 With full sun and a rich drained soil it's possible to grow your own crocus plants. However, if you do, I think it's best to just admire the pretty flowers and leave the harvesting to commercial growers! When October comes, there is a short period of time to harvest. The flowers blossom at dawn, and then quickly wilt away as the day passes, and will bloom within a one to two week period. Mistakes, like leaving them drying even slightly too long, mean the threads are ruined. As you can imagine this can be very costly in time and money! Click for more general info. Today we primarily use it for cooking, but recent studies have shown that it has a wide range of health and medicinal uses. Read more on saffron benefits. And with its staining qualities, it also makes an excellent, but pricey dye. Cumin - The ancient plant that's documented in the Bible!